The Viking Voice | Perspectives: Art or Vandalism? Is graffiti art or vandalism? It might seem that there are only two sides to this argument. Graffiti often takes on a negative connotation. Some even consider it synonymous with vandalism, or view it as property destruction, but why do people always deal in absolutes? To simply say “all graffiti is art” is a lie. Not everything spray-painted on a wall, scratched on a bathroom stall, or written on a picnic table, is art. However, to claim the opposite is just as much of a lie. If Van Gogh’s “Starry Night” had been painted on a wall, would people have forced him to wash it off? It depends on who owns the building. Graffiti could be called art without a canvas or it could be called vandalism. But who gets to make this determination? Art is in the eye of the beholder. But what about in the school? 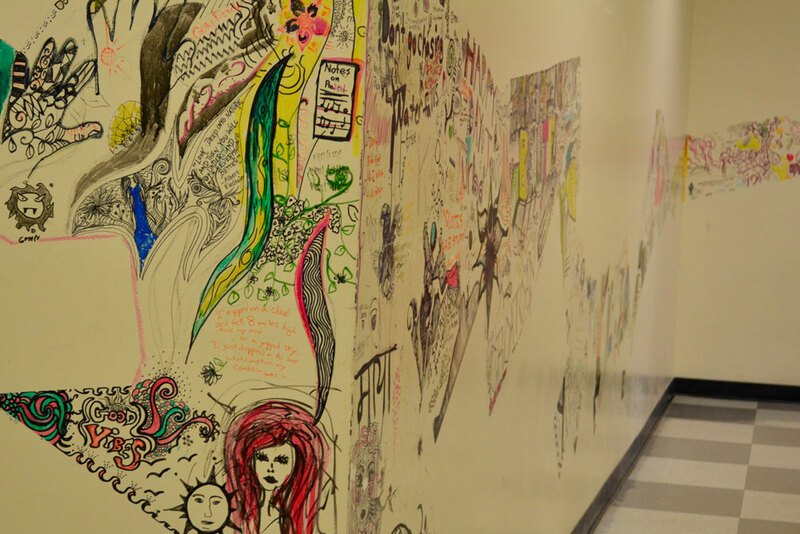 We have a wall stretching down the corridor with drawings, phrases, and lyrics crammed onto every inch of its shape. What is the difference between drawing on this wall and drawing on, say, a table? A teacher came up with the wall project for a class, and now it is just a part of the school. However, what about traditions started by students? They are deemed to be vandalism. However, art is supposed to be a statement, to mean something, to be spontaneous. If people always colored inside the lines, we would get nowhere. Great art happens when people do things they are not supposed to. I’m not saying that graffiti is always great art, but everyone starts somewhere. Art is extemporaneous. It is pushing the limits and breaking the rules. It is both original and classic. It is discovering something new, but also tradition. If one of those traditions is adding your own mark or drawing on a picnic table, is that disrespectful? If it is not rude or a distraction, what is the issue? The only problem is it “breaks the rules”. The students of the OHS are artists and spontaneous. We are original. If that is what people are going to call “vandalism”, then vandalism is not that bad. So excuse the art.